Whether you wear the Brass Buckle Padded Collar in Brown under a steel gorget or on its own as a layer of cloth protection and warmth, this arming collar is a great addition to all kinds of medieval, Renaissance, or fantasy outfits. This medieval padded collar covers the neck and top of the shoulders. Its brown, cotton canvas outer layer is filled with wool felt. An adjustable leather strap with a brass buckle secures it at the front, just underneath the neck. 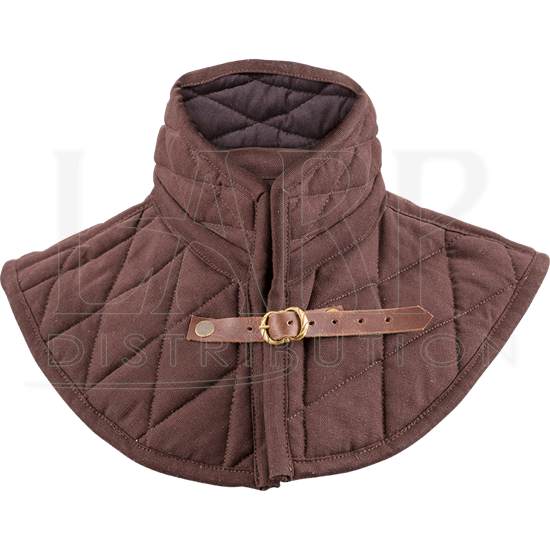 Give an armoured look comfort and safety with this padded medieval mantle, or use it on its own to add detail and a light level of protection for LARP, light reenactment, and costume use.